The student fraternities formed in the beginning of the 19th century in university cities throughout what later became the German Reich. From the beginning their ideology was nationalistic and völkisch (roughly translated: racial, but the basis is not an entire “race” but a people bound by blood and fate. This belief became the very core of Nazi ideology a century later). The goal of the fraternities was the unification of all the lands they deemed “German,” and the enemies that stood in their way soon became clear: the ideas of 1789 and the French per se, as well as the Jews. So right at the beginning of the formation of the right-wing student fraternities, anti-Semitism played a decisive role. The second cornerstone of the Burschenshaften is their self-conception as Männerbund. Männerbund means that only men are allowed to take part in the fraternities, and the ideological-theoretical justification for this exclusion lies in their misogynist belief that women are not ‘pure’ enough to be a part of these groups. This idea was theorized by the interwar nationalist ideologue Hans Blüher and become propagated through not only the Burschenshaften but also the German Jugendbewegung (youth movement) of the interwar period. While a very weak “liberal” wing of the fraternity movement also emerged at the beginning of the 19th century, it became irrelevant as early as 1817. At the Wartburgfest in the same year the Burschenschaften gathered to burn books from French, Jewish, and progressive authors they deemed anti-German. Austrian Burschenschaften (who thought of themselves as German, and still do) formed as late as the 1860s. They never even had a liberal wing, but were among the most ruthless and völkisch. They were the first to adopt the Arierparagraph—a prerequisite (still implicitly applied in some fraternities) that only male students deemed Aryan are allowed to join—as early as in the 1890s. Although these Austrian Burschenschaften see themselves as victims of the Third Reich, the opposite is true. They were not banned, as they claim, but willingly disbanded and regrouped into the Nationalsozialistische Studentenbund, the student organisation of the NSDAP, which sought a monopoly on student representation. Many high-ranked Nazis were fraternity members in Austria and Germany, such as Adolf Eichmann or Irmfried Eberl, camp commander of the extermination camp Treblinka. In the post-war period Burschenschaften became a decisive player within organised right-wing extremism in Austria and Germany. Long story short: these fraternities are allowed to hold a ball every year in the Viennese Hofburg Palace. The Hofburg, and the area in front of the Heldenplatz, is one of the most important places in the history of Austria. It is the location where Hitler pronounced the so-called Anschluss, when Austria became part of the Third Reich. The ball functions as a networking event for the elite of right-wing extremism in Europe. The likes of Marine le Pen (Front National), Philip Dewinter (Vlaams Belang), Alexander Dugin (leader of Russian Eurasianism) and Patrik Brinkman (the well-known Swedish right-winger) have attended this ball in the past. Yet it is not simply a ball like any other, as the Freedom Party (FPÖ) always claims. After the Hofburg declared two years ago that it would ban the ball from this location, FPÖ offered to host the event, thereby allowing it to go ahead at the Hofburg. This shows how closely the FPÖ and the Burschenschaften are linked to each other. Before that, the Burschenschaften themselves hosted the ball through its umbrella organisation Wiener Korporationsring (WKR), giving the ball its original name – the WKR Ball. It is interesting that the FPÖ stepped in to save the ball. 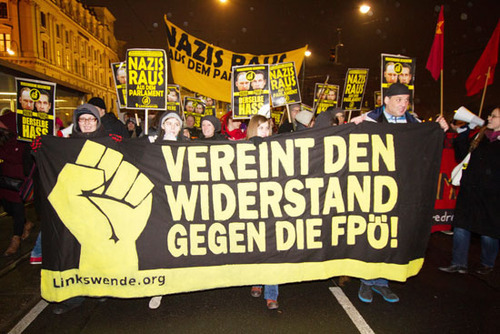 The FPÖ is one of the most successful extreme right-wing parties in Europe. They claim to represent the common people, who are working hard and having trouble making ends meet. In Austria, the working class and sections of the petty bourgeoisie have traditionally voted for the Social Democratic Party. That tradition changed with the rise of the FPÖ 30 years ago. In the last election in September most of the working class voted FPÖ, which succeeded in articlating social problems in terms of race, not class. Their claim of being the new working class party is harshly contrasted by the elitist self image of the Burschenschaften and the ball. 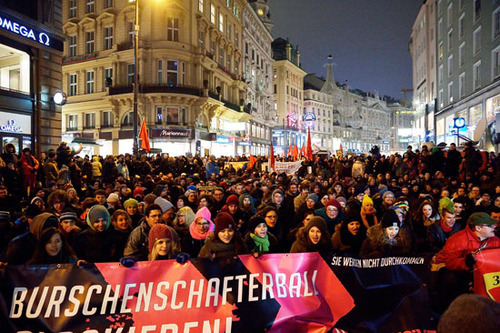 The anti-ball demonstrations this year, organized by the two leftist alliances Offensive gegen Rechts (loosely translated as “Alliance against the Right”) and NoWKR, attracted around 10.000 people, which is a good turnout for an antifascist demonstration in Austria. A third rally from the alliance Jetzt Zeichen setzen (“Set an example now”), which is rooted in humanitarian NGOs and the Green and Social Democratic parties as well as organisations of survivors of the holocaust and the Jewish Religious Community, was banned from the Heldenplatz. The police also passed a decree, which limited some basic citizen rights. In the first nine (inner city) districts, for example, it was prohibited to carry something with you that would allow you to cover up your face. It was up to the police to decide what “covering” meant and it could also include things like scarves or caps. Just a reminder: On this weekend the temperature dropped to -8°C in Vienna. It was our own version of the kind of “Danger Zone” that we saw in Hamburg a few days earlier, when the police could randomly perform identity checks in a regulated area after. The police in Hamburg made exaggerated claims to have been attacked by people, who protested against the eviction of the autonomous youth centre Rote Flora. But it didn’t stop there in Vienna. The police also restricted the freedom of press. They announced an exclusion zone that was far bigger than that which was set up when the president of the United States visited Vienna in 2006. Furthermore, the police also banned the press from entering this zone, which effectively prohibited them from reporting from the ball itself. The press was only allowed to enter for a very short period of time (half an hour) and only accompanied by a police press officer. Antifascists are victims of crime and threats whereas the right-wing extremist scene grows bolder by the day. One might think that the ball itself and the police restrictions caused major outrage in the Austrian media, but that would be mistaken. The media outrage was over the actions of the antifascist protests, focusing on what the BBC termed nothing but “minor incidents” such as smashing windows. But wait, it got worse. The president of the Viennese police said live on TV that he wanted to identify those injured by the police that sought help from the rescue service so that he could press charges. Essentially, those who sought medical attention can now be prosecuted. Just to put things into perspective, the headquarters of Offensive gegen Rechts had to function as mobile hospital because of the many injured antifascists. Two special vehicles from the rescue services, which only apply in states of disaster, were activated along with 5-8 normal ambulance vehicles. And the persecution of the anti-fascist movement is still not over. The same police president called for demonstrators to be “hunted down.” Also, he used the expression, “Wer sich mit Hunden ins Bett legt, wacht mit Flöhen wieder auf” (literal translation: ”If you lay with dogs, you will wake up with fleas,” meaning. if you put yourself in danger, you have only yourself to blame) to dismiss and criminalise antifascist protest altogether. To top this all off, it has recently been revealed that he was in a Burschenschaft in his youth and still holds contact to its members (he is also a member of the Social Democratic party, by the way, at least for now). The end result of this affair is that antifascism in Austria has been increasingly criminalized by the police while the true importance of the ball has received very little media coverage. Antifascists are victims of crime and threats whereas the right-wing extremist scene grows bolder by the day. The antifascist mobilisation was still a very big success and people do want to do something against this ever growing threat, but this time they were failed by the media in a massive way. The imbalance between reports from the foreign press and the Austrian press reached a comical level. The foreign press was very critical in their reports of the ball and those in charge who enabled it (such as the FPÖ or the people in charge at the Hofburg) while the Austrian press once again perceived the biggest threat to be not fascism, but antifascism.